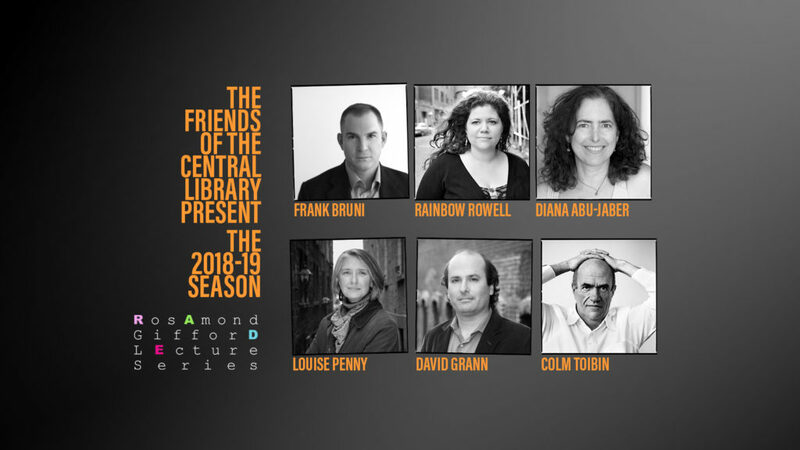 The Friends of the Central Library (FOCL) is pleased to announce the 2018-2019 season of the Rosamond Gifford Lecture Series. The six featured writers include a Syracuse native, New York Times bestselling authors, National Book Award finalists, an Academy Award nominee and Book of the Year authors. All lectures take place at the Crouse Hinds Theater of the Civic Center in Syracuse. Op-Ed columnist Bruni writes about politics, popular culture, food and gay rights for the New York Times. He has written three bestselling books: Born Round, a memoir; Where You Go Is Not Who You’ll Be, about the college admissions mania; and Ambling into History about George W. Bush. His most recent book, A Meatloaf in Every Oven, is an homage to a tradition, with recipes. Rainbow, an author of young adult and adult novels wrote Carry On, a NYT bestseller and “Book of the Year”. Her book Eleanor & Park was a Michael L. Printz Award Best Book nominee and she’s the writer of Marvel Comics new Runaways series, the story of six teenagers who betray their supervillain parents and save the world. Almost Midnight is her most recent work. Cross-cultural issues appear in much of the work of this Syracuse native. Her novel Origin, set in Syracuse, was named one of the best books of the year by the L.A. Times, the Chicago Tribune, and The Washington Post. Her other works, Crescent, Arabian Jazz, and Birds Of Paradise all received critical acclaim and recognition. She has written two memoirs, The Language of Baklava and Life without a Recipe. This former radio host and journalist with the CBC is the #1 New York Times bestselling author of the Chief Inspector Armand Gamache mystery series. The thirteen novels featuring the charismatic detective are set in Montreal and the idyllic village of Three Pines. Penny has won the New Blood Dagger, five Agatha Awards and five Anthony Awards. Her Still Life was cited as one of the five Mystery/Crime Novels of the Decade by Deadly Pleasures magazine. Grann is best-selling author of Killers of the Flower Moon: The Osage Murders and the Birth of the FBI, a 2017 NBA finalist. The Lost City of Z: A Tale of Deadly Obsession in the Amazon was made into a popular movie. His stories have appeared in several anthologies, and he has also written for the New York Times Magazine, The Atlantic, The Washington Post, the Boston Globe, the Wall Street Journal and The New Yorker. Irish novelist, short story writer and poet Colm Tóibín has been shortlisted three times for the Man Booker Prize. His novels include The Master, Brooklyn, and The Testament of Mary, all of which have won awards. The film version of Brooklyn was nominated for three Academy Awards. Nora Webster won the Hawthornden Prize, and On Elizabeth Bishop was a finalist for the National Book Critics Circle Award for Criticism. His ninth novel, House of Names appeared in 2017. Season subscriptions for the lecture series are available now. Email focl@onlib.org or call FOCL at 315.435.1832. The Friends of the Central Library raises funds to support the Central Library and the Onondaga County Public Library system. Since its inception in 1995, the Rosamond Gifford Lecture Series has brought more than 130 world-renowned authors to Syracuse. For more information, visit www.foclsyracuse.org.